Have you been baking for Christmas? Do you make Christmas cookies a tradition in your family for home and gifts? candies for a variety on the cookie tray. However, each year, finding enough time for all this fun, is limited. I thought I would share it with you today. I am calling my quick, easy and tasty snack mix, "Merry Mix"
loaded with additives to preserve it's shelf life. You can adjust this depending on what you like. Enjoy cashews, add them in. But remember to try and keep the ingredients compatible and those that go together. I might also say, this can also be made in the springtime by using pastel M&M's. In a large bowl, mix all the ingredients and stir to blend. Next you can fill jars for gift giving or cookie tins. I used glass jars which show the red and green Christmas colors. I found these at the craft shoppes this year for 50% off making these nice jars perfect for this project. you can add gift tags and bows around the lids or even an ornament. Tags made from vintage graphics add a nice touch. Add some pretty ribbon and a tag. Finished and ready to give to family and friends. I have to say, this mix is so yummy and looks festive in a candy dish. I hope you will try it or make your own combination of this idea for Merry Mix. but still need a little homemade treat to give. It won't last long either! Enjoy the Christmas season to the fullest. I'll be back again soon to share my holiday decor. 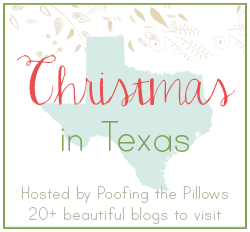 Christmas in Texas Home Tour Blog Hop! a shabby tree in pink and white. I love your Christmas trail mix idea to give out for gifts!! This would be a perfect idea for the neighbors. I am happy to inform you that I am featuring your Christmas tea cups for our Monday Cooking and Crafting with J & J. Hope you have a nice weekend. Thank you for the wonderful snack recipe, what a great hostess gift that would make. This sounds so yummy and really my cup of tea - and soooooo tempting! Thanks for sharing! Your Merry Mix looks as good as I am sure it taste! Thanks for sharing with us. Your Merry Mix looks great and I'm sure people will feel merry when they receive this. I've always loved gifts of food like this and I've totally forgotten about this mix. Thank you for the reminder. Your presentation is gorgeous. Thanks for these great idea's I can make one for the Post Office. I also make candy and cookies. Getting tired so easy as of late. Yummy goodness in a jar. I love how easy this is and how pretty it looks in the jars. I'll have to try this one for sure. I even have some of the stuff already. Have a great weekend in the sunshine! A great idea for a gift. December 6 is St Nicholas' day and we usually offer candies and sweets !!!! Looks like fun my friend. I love every ingredient in that mix...what a great gift to have!!! Mmmm this looks like a jar of yumminess! What a perfect gift for friends and family, and say, too! Oh, what a great idea! I love your Merry Mix! Hope you're doing well. I love gifts in jars, and used to give cookie mixes that I made in mason jars. This makes a really adorable gift! And we know it's yummy! I love your idea Celeste! It sounds delicious and looks lovely! I do bake for Christmas...however, this year, baking for me will be limited. But baking for others will be a GO! I'm making a Gingerbread Loaf with Cream Cheese Frosting for several people...and it's yummy! For a few others, I'm baking my Chocolate Marshmallow Topped with Sprinkles cookies, as well as some delicious Rice Krispies thin [and baked] cookies that are so buttery and good. I'll be sharing my recipes on my blog soon. Watch for them. BTW...I'm totally pain free! I had a massage this morning and all the kinks and sciatica have been taken care of. I can once again move pain free and walk heel to toe!! PTL!! These would make fabulous gifts for friends and associates that are difficult to buy for. I will definitely keep this in mind! OMGosh thank you my friend, your healthy mix will be made up and included in my Grands presents. I will have to think of clever containers to house the yummy mix in so its a hidden surprise. Yes to baking cookies but this year I'm only baking 3 types. Pistachio Biscotti, chocolate chip and butter/sugar star cookies with sugar crystals that look like ice for my Grands. The star cookies hold special meaning in memory of my son and they will be gifted to my Grands. The lead up to Christmas always seems long but funny how time slips away during the final three weeks. Every year we make our Christmas cards and tags (still never gave up our love of creating greeting cards from owning our card company). I need to concentrate on designing, staging and photographing my two theatre holiday presentations for my blog and suddenly I'm feeling the time crunch just as you expressed. Celeste my heart was filled reading your comment on Believe and I appreciate your friendship. As we countdown to the big day I send you love and wishes of merry and bright days. I have made this before and it is so yummy. What a cute idea to use this for gifts. Love the little jars and the tags. Happy Friday and have a wonderful week end. This is a great idea for a gift! The jars and the tags are very adorable. I used to bake and bake at the holidays. But now that it's just me, I don't do much. I did, however, bake dark chocolate brownies today. (Dark chocolate is supposed to be good for your blood pressure.) Good enough for me! Oh that looks really good; think I'll put it on my make list and then tote it around to folks who've helped me during the year. Thanks, Celeste. Those do make nice gifts! Thanks for sharing your recipe. Celestina Marie, HMM Good! Looks delicious and tastes so good! What a wonderful gift idea, Celestina! Pretty, and edible. I think I will give this one a try. Thank you for sharing this. Oh my this looks and sounds so good! I haven't done any baking yet. I'm slow this year! The snack mix looks so yummy! I used to do lots of holiday baking but not so much anymore..we do make lots of unhealthy candy goods...lol Thanks for sharing your recipe.. Blessings! Mmmm... looks delicious, my friend. These are definitely a perfect gift for friends and family. Happy weekend to you, sweet Celeste! I think I will make this for my parents and in-laws, plus for my kids and grandkids. Thanks for sharing it. I love a mix like this - it is addictive. I made something similar for a neighbor for Thanksgiving and added Bugles. Celestina, who doesn't love a good trail mix, and yours sounds delicious. You are so right though, one can add whatever works for them. Enjoy the rest of your week end. Thanks so much for sharing this! Yes, it's a perfect gift and also for a little treat to have on hand. Love the ingredients and the colorful look. Will definitely try this!